#All-things-spatial: Australian generosity mapped – how charitable are we really? Australian generosity mapped – how charitable are we really? Many Australians are happy to give a helping hand to various worthy causes throughout the year. Indeed, each year Australians hand over an impressive $2+ billion in tax deductible gifts and donations, and probably a bit extra in non-declared funds. But collectively, are we as generous as we claim to be? The facts may surprise you. A new analysis of 2013-14 taxation data by MapDeck.com sheds some very interesting light on the donations habits of Australians. It provides a detailed picture of charitable donations made across neighbourhoods of our eight capital cities: Adelaide, Brisbane, Canberra, Darwin, Hobart, Melbourne, Perth and Sydney. MapDeck also provides a State/Territory specific view of donations for cross-border comparisons. Looking at the findings first at a national level, it is encouraging that almost one in three Australian taxpayers is actively donating money for charitable purposes. However, a significant proportion of donations – amounting to 37% of the value of all donations – come from only 5.3% of taxpayers. These taxpayers live in 195 postcodes around Australia categorised as the ‘most generous’ in terms of the rate of donations per local population, as well as the average value of donations. In the 2013/14 tax year, these 677,093 individual donors collectively contributed a billion dollars for charitable purposes (or, on average, $1,416 per donor). The level of generosity of donors differs significantly from one location to another. So, where do the most generous Australians live? New South Wales was the state with the highest number of donors (1.45 million) but Victoria was not far behind, with just over 1.2 million. Interestingly however, the generosity of NSW donors far exceed that of Victorians – NSW residents donated $1 billion that year, a whopping 45% more than Victorians. The average value of donations per donor was $707 in NSW and only $571 in Victoria. However, 38% of Victorian taxpayers made tax deductible donations, comparing to only 36% of NSW taxpayers. So, while NSW donors appear more generous, donating for charitable purposes is slightly more prevalent among Victorian taxpayers. With exception of the ACT, the rate of donation and average values per donor for the other States and Territories are substantially below the two most populous Australian states. Given the distribution of the Australian population, it is not surprising that almost 82% of all donations come from capital-city residents. The average donation per capital city resident was $655 in 2013/14, comparing to an average of $573 for all Australian donors. On a city by city level, close to 40% of all gifts and donations reported to ATO in the 2013/14 financial year came from Sydney residents ($848 million), while residents of Melbourne contributed only 27%, or just over $607 million. Sydney, Melbourne and Brisbane accounted for a combined total of 80% of reported gifts and donations, while the remaining five capital cities made up only 20% of the overall sum. Sydney-based donors contributed on average $872 in gifts and donations in 2013/14, and were followed by Melbourne and Canberra donors with average donations per donor of $638 and $603 respectively. But which of our Australian capital cities has the most engaged community in terms of contributions to charitable causes? It turns out it is Canberra - the nation’s capital, filled with hardworking public servants and households with the highest average incomes. The city had the most generous population with 45% all tax paying individuals reporting gifts or donations on their statements. This compares to 39% for Melbourne taxpayers and just 36% in the case of Sydney taxpayers. Hobart stands out amongst the smaller cities with 38% of taxpayers making tax deductible gifts and donations. Brisbane with Gold Coast and Perth closed the list at 33% each. Putting the data published by the ATO through a slightly more advanced analysis can reveal even deeper insights about the generosity of Australians. For example, by comparing gifts and donations claimed by individual postcodes with averages for capital cities or Australia as a whole, it is possible to create a simple classification that reflects common patterns of behaviour across local communities. Looking more specifically at the four categories of donors, of the most generous donors (that is, those that donate above average amounts and in above average proportions comparing to the national average) 42% live in NSW. Out of the 677,000 most generous Australian taxpayers, this amounts to a total of 287,000 individuals. Only 30% of the most generous donors, or 204,000 individuals, are located in Victoria. However, 40% of the second most generous group of donors (that is, those who contribute at higher than average rates but tend to donate below average amounts) are from Victoria. NSW has only 34% of all donors in this category. Without trying to fuel the animosity between the two states any further, this seems to be a typical pattern that distinguishes NSW residents from Victorians across several measures analysed in this study. That is, when NSW residents, and Sydneysiders in particular, decide to give, they give generously. Much more generously than residents of any other capital city or State or Territory in Australia. However, donating to charitable causes is more widespread amongst the population of Victoria. Nevertheless, it is interesting to note that the postcode with the highest donation per donor was actually in Greater Melbourne area: it is 3944 (Portsea) with an average donation per donor of a whopping $19,187. Sydney postcode 2027 (covering the exclusive suburbs of Darling Point and Point Piper) with an average donation of $14,180 per donor is only third on the list - after Brisbane postcode of 4009 (Eagle Farm) with average donation of $18,490. 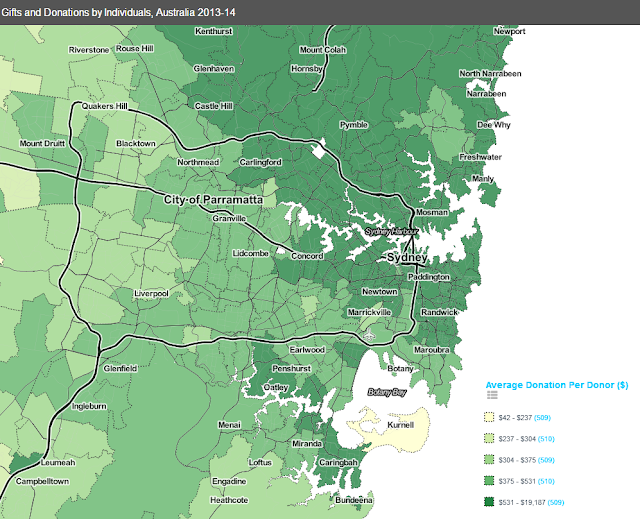 The following maps show how average donations compared across Greater Melbourne and Greater Sydney postcodes. The richness of information contained in this ATO data also makes it possible to investigate some more controversial aspects of our generosity. For example, pinpointing postcodes where residents earn the most but donate very little. There could be many colourful ways of describing the residents of such postcodes but, for the purposes of this article, let’s use a less judgemental label for them, such as “Well-to-do non-participants”. Which State or Territory do you think has the most residents in this category? Log into your MapDeck.com account and find out! 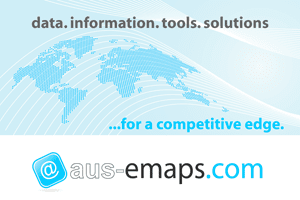 A full deck of interactive maps is accessible to all registered MapDeck users via the links listed below. You will need this invitation code to create a free account if you are not yet a MapDeck user: f10dc1f2 . And if you wish to explore the entire Generosity Profile of Taxpayers by Postcode, Australia 2014 data set and draw your own conclusions, or if you would just like to identify where those 195 postcodes with the most generous donors are located, it is available for a small fee for download in Microsoft Excel format and/or as a subscription for use with MapDeck’s Thematic Mapper app. Implying that “Australians are charitable folks” would be an overstatement - the evidence summarised in this article points rather to the contrary. True, Australians are one nation but we tend to differ quite significantly as individuals, including how generous we are with gifts and charitable donations. However, not to affront our national pride, let’s draw the final conclusion borrowing from George Orwell’s famous quote. That is: it is quite likely all Australians are charitable by nature but some of us are more charitable in practice then others. 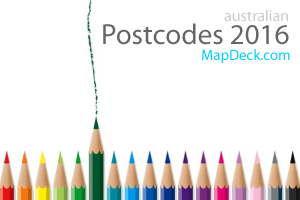 The profiles area based on the Australian Taxation Office statistics for residential postcodes sourced from 2014 individual income tax returns processed by 31 October 2015. The statistics are not necessarily complete. The information can be used for marketing and promotional purposes, or for profiling existing or prospective customers based on their place of residence. MapDeck’s mission is to empower individuals and organisations to make better choices, more informed decisions – so they can reach their goals sooner, succeed faster and on a grander scale. MapDeck is an online marketplace for spatial information and simple-to-use, task-oriented tools to support a variety of activities, be it business or investment related, environmental, community or policy focused.